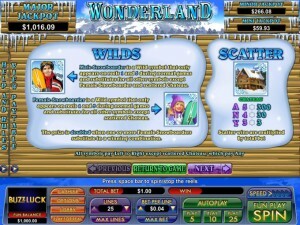 Wonderland is a winter inspired game, which was designed by Nuworks. While not directly themed around Santa, it’s the kind of game that you can give a try if you really love the winter holidays and everything they have to offer. 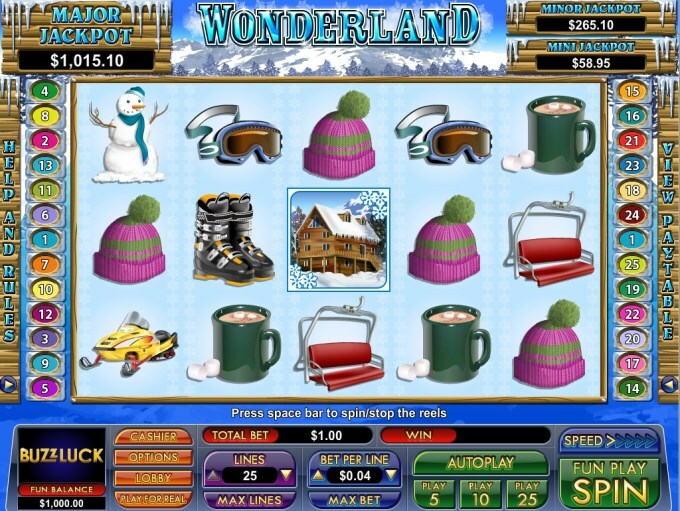 From snow men that you can build, to hot chocolate mugs, snowmobiles and other things that you can enjoy during a winter vacation, there are a lot of things in the design of this slot that will be appealing for many of its players. You’re getting the same 5 reels and 25 bet lines that are available in 90% of the Nuworks slots. The features are largely the same ones as well, though re-spins are used instead of free spins. Scatters, wilds and multipliers are part of it also. The jackpot is worth $7,500. 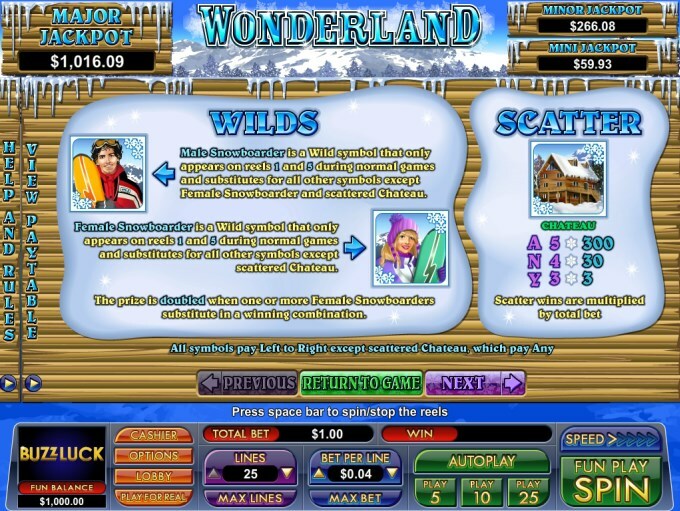 The list of Wonderland features starts with the two wild symbols, after which it continues with the scatter, with re-spins and a win-win feature. Two snowboarders are used for the roles of the wild symbols in Wonderland. One is the Male Snowboarder, appearing on the 1st and 5th reels. The other is the Female Snowboarder, also reserved for the same two reels, the 1st and 5th. The difference is that when the Female acts as a substitute, a multiplier of 2x will be applied to that particular win, so you earn twice as much when she gets involved. Neither wild can substitute for the scatter symbol. If you get the Chateau symbol on the reels, no matter in which positions, you can expect to get a prize from it as long as at least three are present. The payouts start at only 3x the bet, but can go up to 300x. When two snowboarders are present on both the 1st and the 5th reels, at the same time, the re-spins feature will trigger. The middle three reels are the only ones that are spinning in this case, while the other two are held. The appearance of a scatter on the middle reel will give you one additional re-spin. Just in case these re-spins don’t bring you any prizes, or very small ones, there is a Win-Win feature as well, which pays as much as 200 times the total bet as a consolation prize. You have 25 coins to work with, and you are permitted to modify their value within the range of $0.01 to $1. You end up with bets of up to $25. The game offers you $7,500 cash, the equivalent of 300 times the total bet. The scatter is the one that’s going to give you that one. 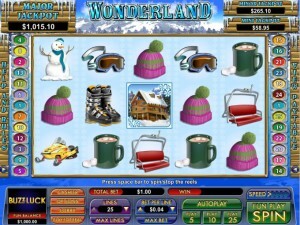 The design looks like a pretty typical one for a slot machine which is inspired heavily by winter and the activities one undertakes during this season. From sleighs, to snowmobiles, snowmen and snowboarders, the game tries to make winter sound as fun as possible, which it can be if you try to ignore the cold and focus on the things you can do instead. Symbols: Male Snowboarder (wild), Female Snowboarder (wild), Chateau (Scatter, 300x total wager), Snowmobile (2,500 coins), Snowman (1,000 coins), Sleigh (500 coins), Red Bench (300 coins), Boots (250 coins), Goggles (250 coins), Hat (200 coins) and Hot Chocolate (200 coins). 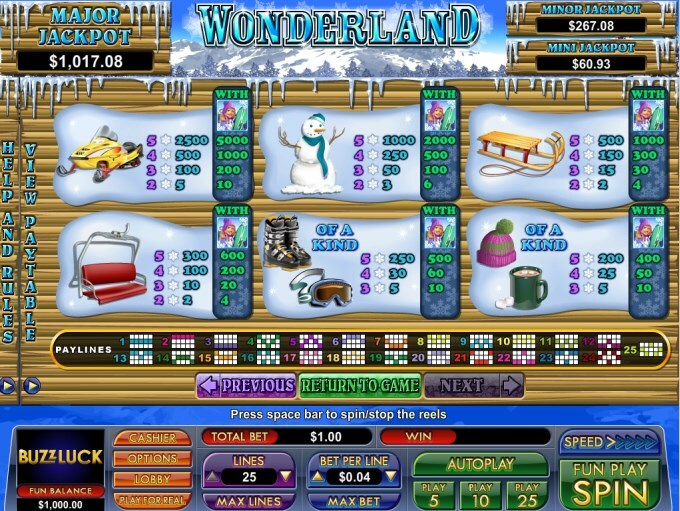 If you’re tired of the same old Christmas themed games, Wonderland chooses the Winter season and focuses only on the sports and activities that it brings you. 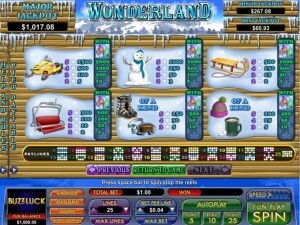 Wonderland can be found at any NuWorks casino, where you get a chance to play it for real money or in free mode.